The Blazers were one of the most rewarding musical discoveries of the '90s. On the tail end of the rockabilly revival that their mentors Los Lobos helped launch, the Los Angeles-based Blazers have kept the fire of Latino roots rock (and the still smoldering spirit of Richie Valens) burning. While Los Lobos briefly flirted with more traditional Mexican music, especially in the soundtrack to "La Bamba" (the film biopic of the late Valens), of late that band has been going into progressively more distant (if increasingly interesting) orbits. The Blazers' latest takes the opposite tack: The East L.A. band fully immerses itself into the sounds of traditional Mexican and Latin American music, with cumbias outnumbering rockabilly 2-0, and sons, danzas and other Latin forms making appearances. And what great traditions to draw upon! Like it's American cousin the blues and bluegrass, Mexican folk music is full of a worldly wisdom that only those fully immersed in life and living can acquire. Then there is the emphasis on instrumental virtuosity common to many folk musics. 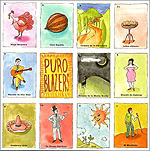 While several of the songs here were written by the band, and others are of similarly recent vintage, most are in the style of the Mexican folk song. Most of the songs are also performed in an acoustic setting  the electric guitars have been replaced, by and large, with six- and twelve-string Mexican guitars and mandolins. The band's four regular members have been augmented by a horn section and additional percussionists. And yet, given all this, there is still a certain contemporary sound to the music  after all, The Blazers are American rock musicians, not peasant farmers from Oaxaca. The difference shows up in the rhythms, which tend to be more complex than traditional Mexican forms (which tend to be more staid than those from other Latin American countries), as well as the instrumental solos. The result is what you might get at a large L.A. Mexican-American wedding  music somewhere between American rock 'n' roll and traditional Mexican music, but music with a sense and sound of life like no other, music made for dancing and singing and smiling.